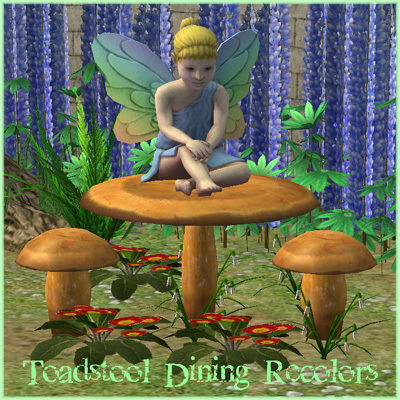 When I first saw LadyAngel's Toadstool Dining Set, I knew I had to have it. 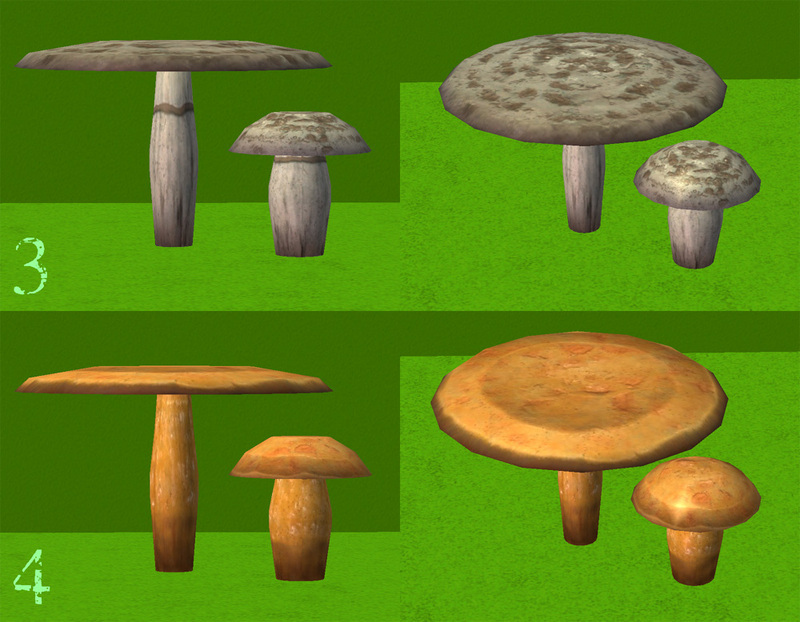 Then, I knew I had to have more recolors of it that fit in more with my game style.. Here they are to share with you all. 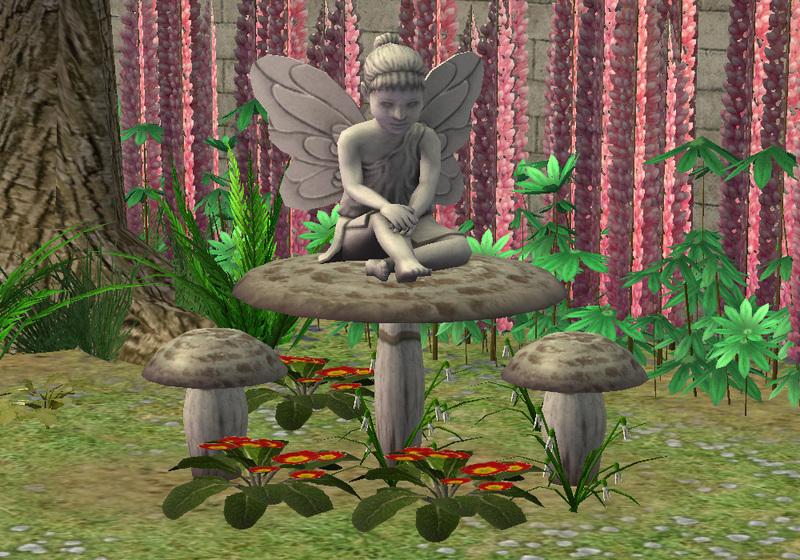 I know, I know -- LadyAngel's mesh comes with a red toadstool top, but this one is different: the dots are a different pattern, the stem is different, and it's not shiny. 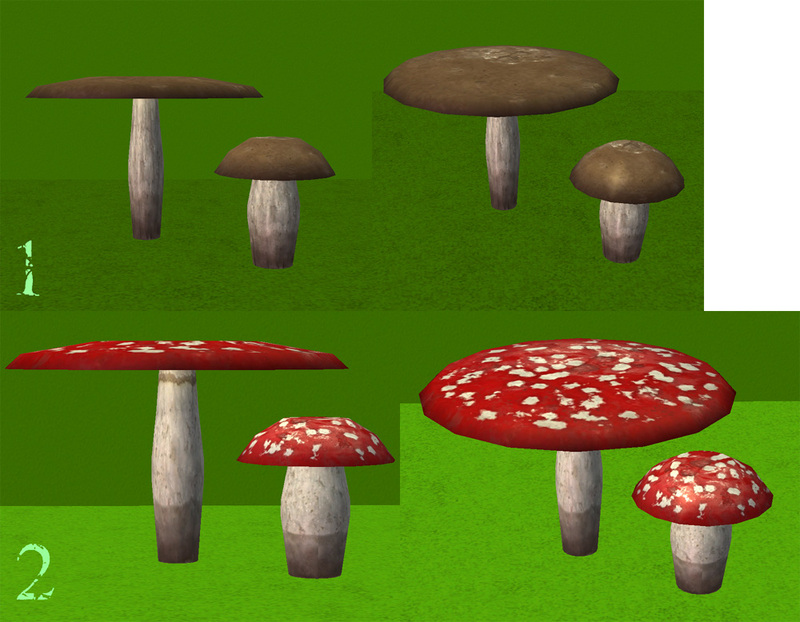 None of my toadstool recolors are shiny. The first time I got all ready to do this upload, I discovered I forgot to take pics of one of my recolors. My Sims insisted they be in on it this time since I was using their lot for pic-taking. 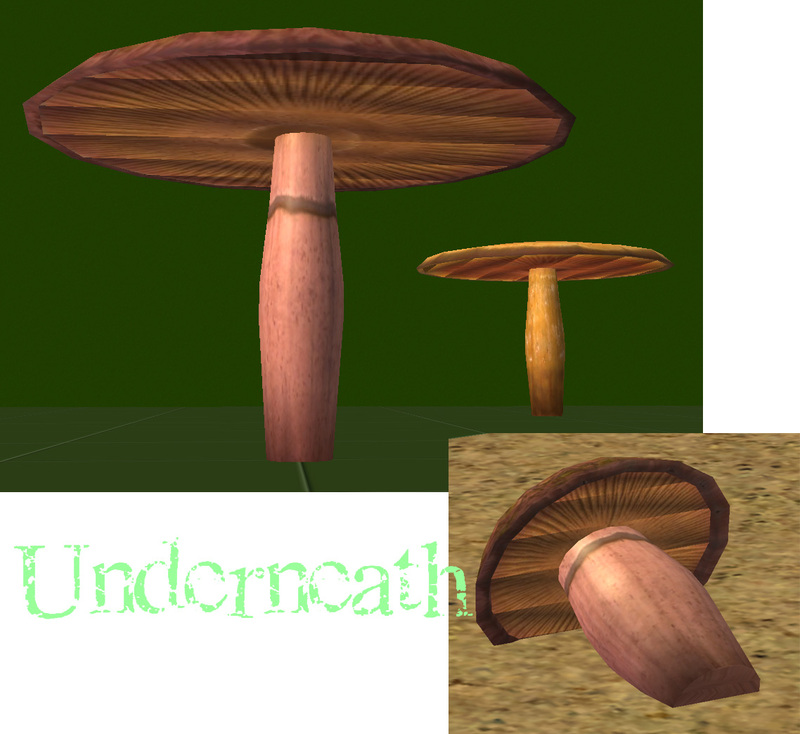 I recolored the undersides with the correct texture that came with my mushroom graphics, but as you can see, the mesh has lines dissecting across the underside. Oh, well. 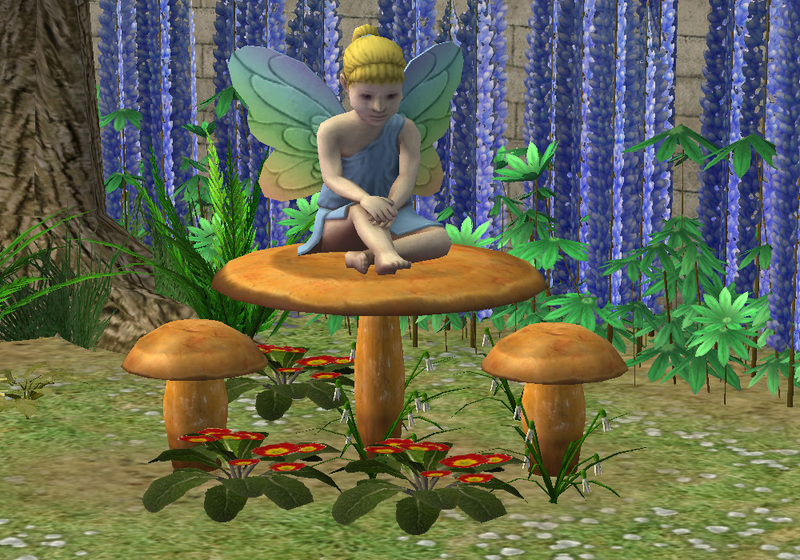 At least we can all live more peacefully knowing these toadstools have air vents on their bottoms. I guess there's not much else to say except that I hope you like them. A big thank you to all the people at MTS, especially those who created this great site and keep it going. The creators of CEP and SimPE -- how could we make our game our way without them? My textures are made with Filter Forge. Some or none of the foilage used were created by gwenke, k8(Parsiminous), alexstanton, veggy(? ), macarossi, khakidoo, bienchen and Suza(Simply Styling). Most can be found here at MTS and all were in my downloads folder at pic-taking time. 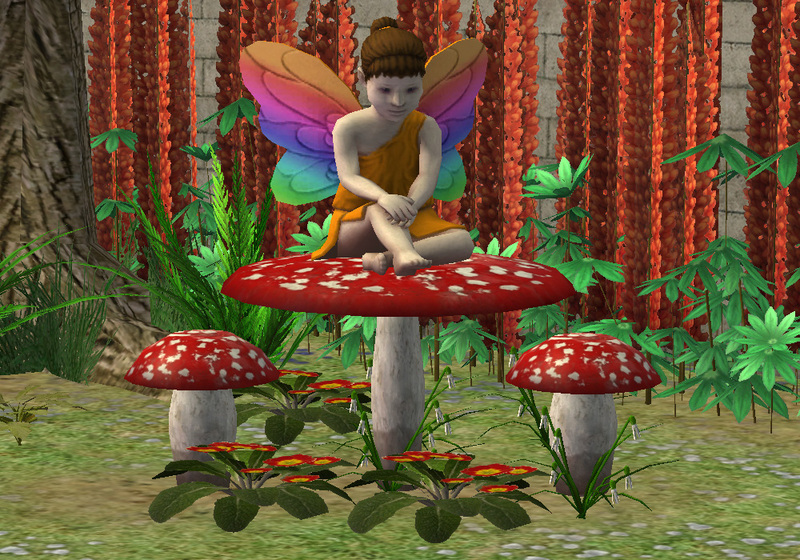 The lovely colorful fairies are here at MTS by Michelle. The male sim is my adaptation of "Sim D" from GoS' 5th birthday celebration. He's wearing pants by aikea guinea(GoS), makeup by KiaraRocks(MTS), stubble by Meshy(PBK), earrings by Ren(MTS), hair by Trapping(GoS), Schuldig's blind contacts; the tats and zombie skin are a little something I whipped up. The female uses the same makeup and contacts, lip gloss by bruno(MTS), hair by Rose, outfit by Tehhi(MTS), skin by treeag(MTS). Seagull by Tinkle at Black Pearl Sims. 85 people have said thanks to Deatherella for this download.